During my early work years I commuted braving the streets of Washington, DC, weaving in and out of buses, cars and taxis. 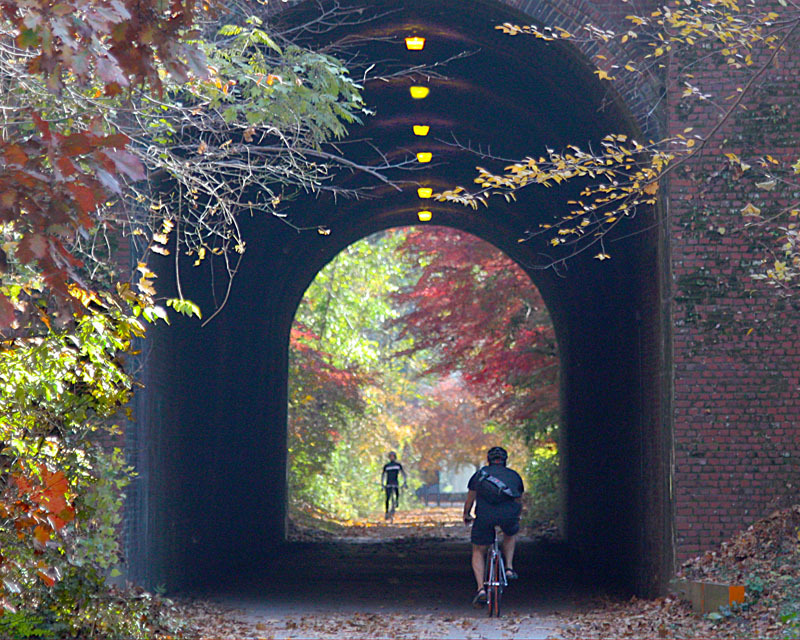 Then in the 1990s the Capital Crescent Trail was completed from Bethesda to Georgetown (see Tunnel image above). This meant that I could avoid traffic for 5 miles from my home to downtown Georgetown before riding the last mile on city streets to the World Bank. Now that I am retired, I ride extensively and both for pleasure and fitness on the Capital Crescent Trail, the C&O Canal towpath in Washington, DC and the Legacy Trail in Venice and Sarasota Florida. My experience over many years--first adventure, then commuting and now riding for pleasure and health--is that these trails provide significant value in terms of safety, convenience and beauty. They also benefit the environment. I would definitely be willing to pay more in taxes for quality pedestrian and bicycle trails, not just for my own use, but also for the vibrancy they add to my community. I am not alone. People generally think highly of bicycle and pedestrian trails. One survey in Florida finds that 95% of bicyclists and even 85% of non-bicyclists agreed that good facilities add value to their communities (Winters, Hagelin and Avery 2004). There are some good reasons for this. Trails encourage participation in healthy and enjoyable activities such as walking and riding a bike. Greenspace corridors with trails help the environment by providing habitat for local species and reducing water runoff. Tourists are attracted to bicycle byways resulting in local hotel stays and food purchases. If located in urban areas, trails with few road crossing become bicycle highways allowing locals to shed their cars and commute to work on bikes. Trying to value of the benefits of such trails is difficult because in most cases no admission fees are charged for entering trails. Complicating matter even further, all bicycle trails are not created equal. For instance, the Pinellas Trail that starts in downtown St. Petersburg, Florida is a protected bike lane with no surrounding greenspace. 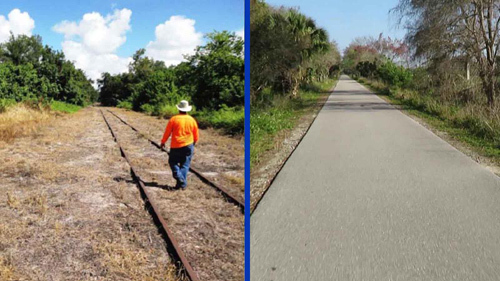 The same trail changes dramatically over the course of the next 40 miles as it heads towards Tarpon Springs. The over 25 year old trail goes through parks and rises over busy highways on dedicated bridges. At points it has two paths, one for bicyclists and one for pedestrians. The Allegheny Passage is a 150 mile trail that runs from downtown Pittsburgh up and over the Allegheny Mountains and down into Cumberland Maryland. It changes from an urban trail to one that passes through some of the most beautiful scenery in the country. The characteristics of the neighborhoods surrounding trails seem to make a big difference in terms their desirability and consequently their value (Nichols and Crompton 2005; Anderson and West 2006). Sometimes it is even necessary to evaluate separate parts of trails to accurately assess their economic and social benefits. Because bicycles trails don’t charge fees, measuring the monetary value of a trail has to be done in more indirect ways. This isn’t a new issue in economics. There are some established economic techniques to measure the value of public trails (and roads and parks) which don’t charge admission. Several studies have tackled the issue of how to measure the benefits of bicycle trails. One in particular stands out in providing a nice framework for measuring the benefits of bicycle and pedestrian trails (Lindsey et al. 2004). This study of trails in Indianapolis focuses on real estate values, but also describes other benefits of trails such as improved health, reduction in traffic, improvement in the environment and increased tourism (Table 1). Not all benefits need to be measured in every single study. In fact, most academic studies concentrate on one or two benefit categories. Benefit consultant reports tend to be more comprehensive examining all the hardest to measure benefits. A good example is an economic report on the Miami Underline Trail that measures the monetary value of construction, park operations, existing real estate value and new development. The report also discussed tourism and environmental benefits, but it does not analyze them in detail. A good strategy is to concentrate on the main expected benefits of a new trail given its location, quality and characteristics. A trail cutting through a wheat field is unlikely to raise real estate values, but a green corridor going through a residential area probably will have an impact. An urban path may bring more traffic to local businesses and may draw people out of their cars for commuting to work. The characteristics of trails along with their locations greatly impact which category of benefits are most important. Surveys generally are necessary in order to quantify the benefits of trails. This might include a formal study of real estate prices, a survey of rider and pedestrians using the trail or interviews with local business owners concerning customers that come from the trail. Care should be taken when using different techniques for measuring the benefits of trails and bike paths. Sometimes the techniques and measures overlap and this can result in double counting of benefits. For instance, the health benefits of trails may be the reason people desire to live near a trail. They want to be close to a trail to facilitate their exercise. Thus, the rise in real estate values may already reflect at least part of the health benefits of a trail. Some methods for measuring trail benefits are easier than others. A number of data sources are available for measuring increases in real estate prices surrounding trails. This includes tax records and real estate pricing sites. However, modeling of the real estate prices is a bit complicated. To estimate the impact of trails on real estate prices it is necessary to control for such factors as size of home, number of rooms, number of bathrooms, quality of local schools and others variables that can impact price. Also, the price increase must specifically be attributed to the creation or existence of a trail. This can be measured either by examining the value of homes before and after the trail is built or through statistical techniques that control for factors that impact home values. The increase in tourism generated by trails will result in additional local income. To get the details right, surveys are necessary to estimate spending due to a trail. This would involve estimating the addition number of hotel stays and spending on food. Questions are necessary identifying those who traveled from a distance to ride on the trail. It is not enough to just count trail users because many may be local riders. The contingent valuation method listed the table is not easy to implement. Contingent valuation surveys show random samples of people different types of scenarios (pictures of before and after a trial such as figure 1). Then the same people are asked how much they would be willing to pay per year or month for the change. This sample also should have different strata for those who live near and distant from the trail or greenway corridor. The benefits can be estimated by the number of people that are represented by the sample. The caveats are important, but they are not insurmountable. For each trail situation a good strategy is to identify the key benefits and then delve more deeply into them. For instance, a trail running through a suburban area is likely to have a significant impact on real estate values, but one running by forests or farmland probably will have marginal impact on land prices. A trail running through an already existing state park or forest area is likely to have little environmental impact, but one in an urban area may contribute significantly to reduced water runoff and species preservation. In later posts I will be dealing more specifically with each of the benefits that can result from trials or greenways. This includes increase in real estate values, health benefits, business and tourism. As the links become available I will post them here. In the meantime, you can sign up to receive of new post through the link at the bottom of this posts. Anderson, Soren and Sarah West. 2006 “Open space, residential property values, and spatial context.” Regional Science and Urban Economics. 36: 773–789. HR & A, Advisors, Inc. 2015. Creating Value Through Open Space: The Economic Impacts of The Underline. Report prepared for Friends of the Underline, Miami, Florida. Lindsey G, J. Man, S. Payton, and K. Dickson. 2004. 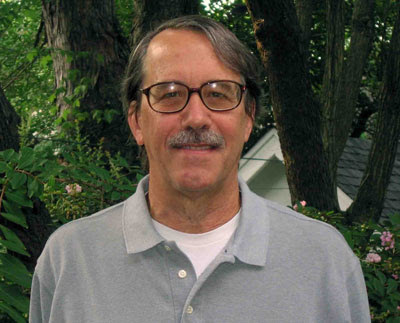 “Property values, recreation values, and urban greenways” Journal of Parks and Recreation Administration 22(3):69–90. Nichols, Sarah and John Crompton. 2005. “The impact of greenways on property values: Evidence from Austin, Texas.” Journal of Leisure Research, vol. 7, No. 3, pp. 321-341. Winters, P, C. Hagelin and J. Avery. 2004. Statewide Survey on Bicycle and Pedestrian Facilities. Report Prepared for Florida Department of Transportation Safety Office, University of South Florida, Tampa, Florida.